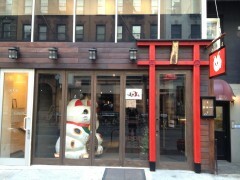 Lucky Cat (on 53rd btw. 2+3rd) is now known as HinoMaru Lucky Cat and they’re starting an INSANE ramen special today that’s going for the entire month of may. Every Tuesday from Noon-1pm, the first 50 customers will get a bowl of their shoyu ramen plus an Asahi beer for a whopping $3 bucks. 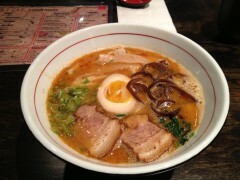 Love ramen? Love beer? Love saving money? This one’s for you. I can’t even imagine how early you’ll have to get there to be one of lucky top 50. Those brave enough to check it out, let us know how it is in the comments! Posted by Jared Scharff at 9:00 am, May 6th, 2014 under Lucky Cat Ramen.